Wild Ginger Software has been in business for over 20 years developing their fashion design software. Their main product is PatternMaster, and its professional cousin Cameo. Cameo has a four-digit price tag, so I’m working with PatternMaster – their product for home sewers. PatternMaster comes in several different flavors. Each is geared toward designing a different type of apparel, and is purchased as a separate application. PatternMaster Boutique drafts women’s wear. PatternMaster Knits drafts knit patterns for women’s wear. PatternMaster Curves drafts lingerie, activewear and swimwear for women. PatternMaster Child’s Play drafts children’s wear. And finally, PatternMaster Tailor Made drafts men’s wear. Child’s Play and Tailor Made are the two most inexpensive products at $125. Knits and Curves retail for $150, and Boutique runs $225. So here’s a case where being a menswear sewist saves money. I’m using PatternMaster Tailor Made version 6 (July 1, 2015 release) on Windows 10 with only some slight glitches. Whichever version you choose, PatternMaster comes as two applications bundled into one install – Style Editor, and Pattern Editor. Style Editor opens when you launch PatternMaster from the Windows Start menu. You can get to Pattern Editor from inside Style Editor. 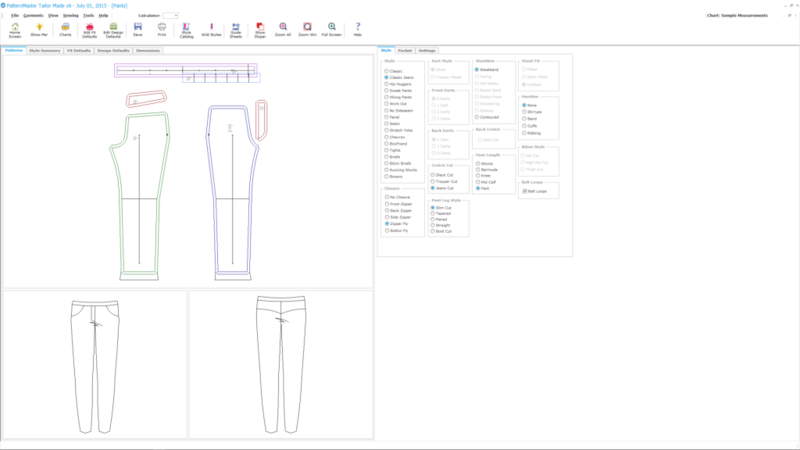 Style Editor can “automatically” draft patterns for several styles of garments. You begin by measuring yourself. Plug in your measurements, and Style Editor creates a fitting shell you sew up in muslin and try on. Then, fit yourself and tweak the settings within Style Editor to create a sloper that fits. Once you have a fitting sloper, Style Editor can create a vast array of different types of garments. You can add many design details, such as collar treatments, just by clicking a button. Here’s a screenshot of a pair of jeans, straight out the Style Editor’s starter catalog. (Click/tap to enlarge). For ultimate control, PatternMaster also provides the Pattern Editor. 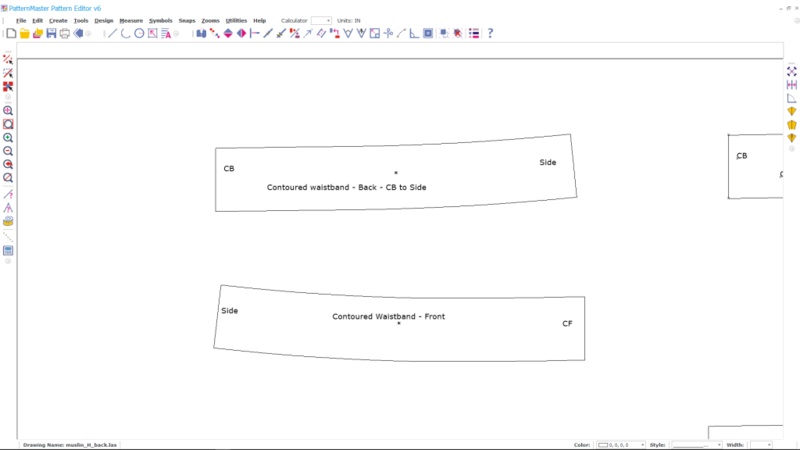 This is a CAD (Computer-Aided Design) application that allows you to directly edit the curves and style lines of the pattern. It works similar to a drawing application such as Illustrator or Inkscape, but its feature set is geared specifically towards creating flat pattern drawings. You can create a garment with Style Editor, then open in in Pattern Editor and tune subtle details. This is a one way trip, however – once you edit a Style Editor creation in Pattern Editor, there’s no way to work on it further in Style Editor. Wild Ginger expects you to use the Style Editor as much as possible, then move to Pattern Editor for final touches – if that’s even necessary. But that’s not the only way you can use PatternMaster. I’ve decided to completely ignore the Style Editor, and use the Pattern Editor exclusively. (You can see in the Style Editor screenshot above it says “Sample Measurements” in the upper right corner – I haven’t even bothered to enter in my own measurements). It’s possible to draft new patterns totally from scratch using just Pattern Editor – it’s simply more work to do so than relying on Style Editor to do the heavy lifting for you. Or you can scan/photograph a paper pattern, then trace it in Pattern Editor and further refine it digitally. Which is what I’m doing with my pants. I was glad to see some external validation of my intent to use PatternMaster this way. 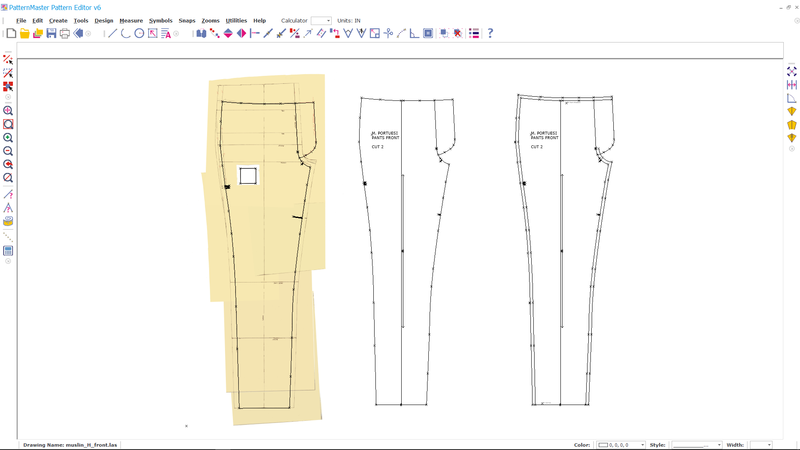 Catina Ferraine is a professional patternmaker who uses PatternMaster and its professional counterpart, Cameo. She’s been answering questions on PatternReview, as well as hosting a series of YouTube videos and Google Hangout videos. Her videos focus exclusively on the Pattern Editor and demonstrate how to perform the same kinds of flat pattern manipulations you might do with pencil and paper. Most of what I know about PatternMaster I’ve learned from her videos – which is good, because Wild Ginger’s product documentation for the Pattern Editor is pretty sparse. The user manual is 20 pages including cover and index, and simply describes what the commands do. Even the online tutorial videos bundled with the product only provide an onscreen demo of how to use each command. You don’t get any idea how the features are supposed to be used to create and edit a pattern. This fits in with Wild Ginger’s thoughts on how they want you to use PatternMaster – you should be spending most of your time in Style Editor, which has more documentation and handholding. Wild Ginger does sell additional tutorials for Pattern Editor that supposedly provide more insight, and they even sell an entire textbook about flat pattern drafting using a CAD tool such as Pattern Editor. But I haven’t purchased them. Here’s Catina’s YouTube video that demonstrates the process. Essentially, what you do is import the scanned image of your paper pattern (she uses a digital photo, taken dead-on to avoid distortion). 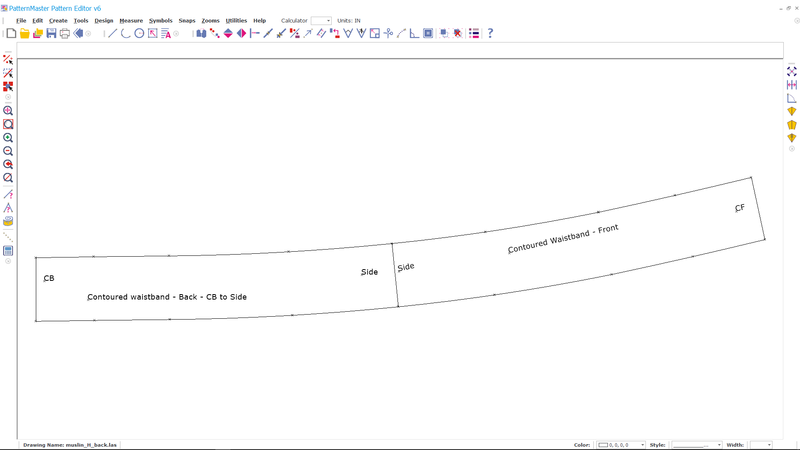 Then, you use Pattern Editor’s CAD tools to trace lines and curves over the scanned image. You can zoom in at any time to place more precise points and lines. Here’s a screenshot of my digitizing work in the Pattern Editor. 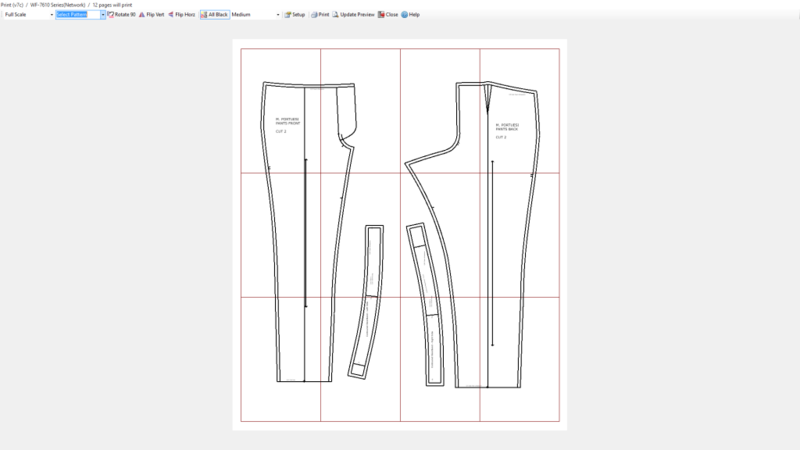 I’ve imported the digital image of the pants front I stitched together from several scans using Inkscape. The black outlines are the curves I’ve drawn using Pattern Editor’s drawing tools. Note the white square. This is the 2-inch calibration square I printed and taped to the pattern. It is used to make the dimensions of the pattern inside PatternMaster match the “real world” measurements of the tissue I scanned. In her video, Catina does this calibration using an older version of Pattern Editor. She pulls out an onscreen calculator to do some math by hand and then do a percentage reduction. PatternMaster 6 has a new command, “Calculate and Scale” which automates this process. I drew a square over top the scanned alignment box and asked Pattern Editor how big it thought the square was – 30 inches to a side. This is much larger than the square’s size in real life – 2 inches. I don’t know why PatternMaster was off by a factor of 15, but it may have something to do with the pixel dimensions and resolution of the scanned image. I can only speculate. In any case, I selected everything on the canvas, then invoked “Calculate and Scale”. It has a form with two blanks – one is how big something is (30 inches), and how big it should be (2 inches). In one stroke, Pattern Editor resized the alignment box down to 2 inches, but also resized everything else proportionally – meaning the pattern should now be the same size in the computer as it is on the tissue. In this screenshot, I cloned the front pants outline for the various stages in its refinement. The middle version has been aligned perpendicular to the canvas and has notches, circles and grainlines added. The rightmost version is a copy of the center, but with a 3/8 inch seam allowance added everywhere except for fly and bottom hem. 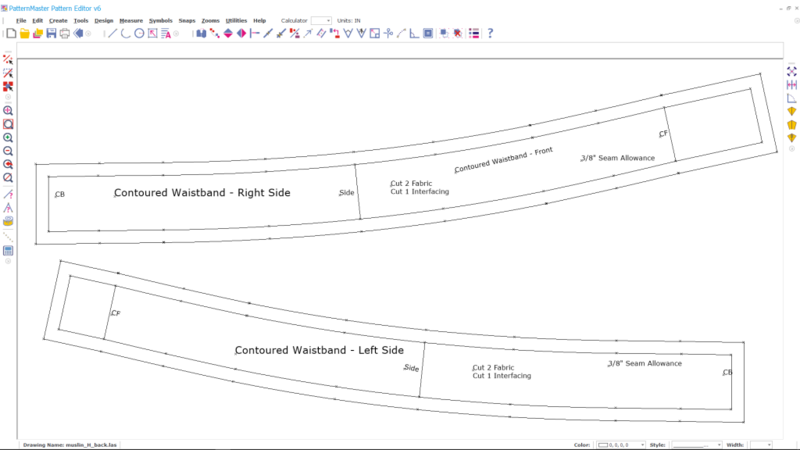 Pattern Editor’s “Offset” tool creates a parallel line or curve a fixed distance from the original, making the seam allowances a snap to draft. 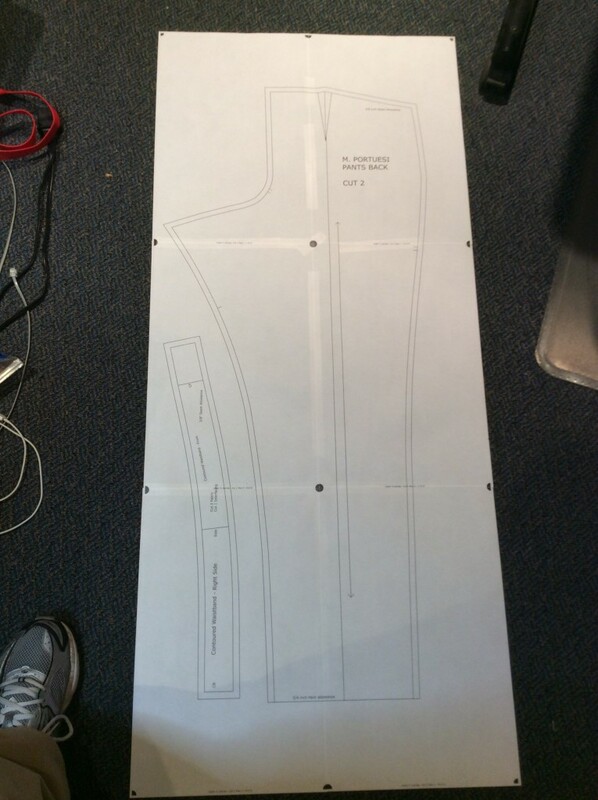 With both front and back pattern pieces traced, I was ready to draft the contoured waistband pattern piece. The original contoured waistband from Vogue 8940 was two pieces – a left and right – joined at the center back seam. The righthand piece was longer than the left to allow for an extension for a button or other fastener. I kept the same approach for my new waistband. I began by making two pattern pieces from the front and back pants. 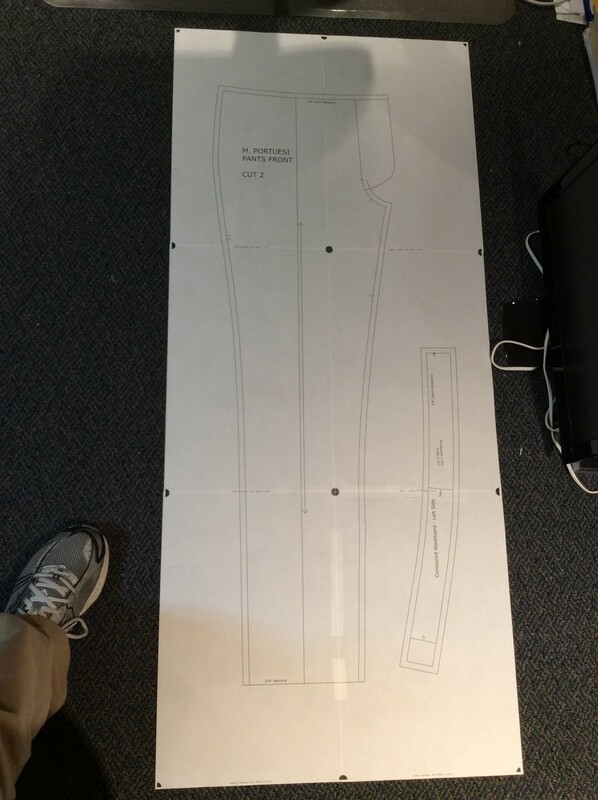 In each case, I used Pattern Editor’s Offset command to make a curve parallel to the waistband seam of the pant. Then I drew short lines to close the waist band piece, making the lines perpendicular at center front/center back. I used Pattern Editor’s Align tool to join the front piece to the back piece at the side seam. This is the block for developing the left and right pattern pieces. Here’s the finished contoured waistband. The left and right have separate extensions, and 3/8 inch seam allowance has been added all around. 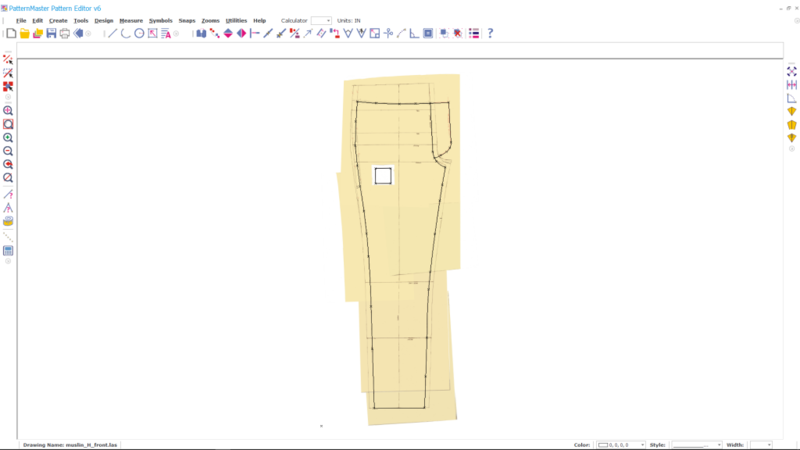 Once you have created the pattern pieces, PatternMaster has some useful tools to help with layout and printing. One tool, which I’m not covering here, allows you to calculate the amount of fabric you need to create your garment. It gives you a virtual piece of fabric that you lay out the pattern pieces on. When you’re done, it tells you how much fabric you used for the layout. You can enter the width of your fabric bolt, and you can even define simulated stripes and plaids so you can get an idea how they affect the layout and your fabric needs. The yardage tool is not very refined – I found some aspects initially confusing – but in the end it did get the job done. Once you’re ready to print, the Print tool works in a similar way. You lay out your pattern pieces to print out across multiple sheets of paper. 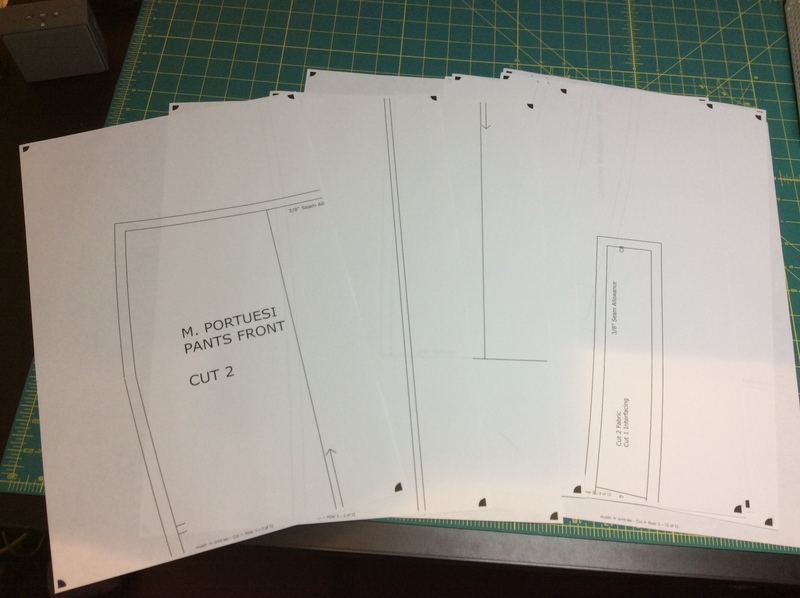 Here, I have laid out by hand the entire pants pattern to print across 12 sheets of 11×17-inch paper. I carefully arranged things so that I didn’t have to tape the seams running down the very middle of the printout. The printer spat out my pattern in less than a minute. With 11×17 sheets and no need to join down the center, the trimming and taping went fairly quickly. We’ll talk about the problem nobody warned me about. Glad you’re enjoying my article! I didn’t go into detail about it in this article, but if you’re seriously considering playing with PatternMaster, you should be forewarned. Pattern Editor is a CAD program, so people who are used to drawing tools such as Illustrator will find Pattern Editor very foreign to them at first. Generally in Pattern Editor you issue a command, then select the item you want the command to apply to. That’s the reverse of most graphic design tools, where you select an item then tell the app what you want to do to it. In Pattern Editor, you might then have to perform more actions in sequence – for instance to transfer a dart, you have to click the points which define the dart and define the direction to transfer, all in a specific order. Even basic things like the mouse buttons work differently – the right mouse button always warps the cursor to the nearest control point and selects it. It took me some time to get used to the way some things are done with this program. Still, for pattern making some of the things it does do work VERY well.